New Growth Gives Back | New Growth Hair Magazine | We capture the culture of urban barbershops and beauty salons. One of Charlotte-Mecklenburg’s poorest schools has been selected for a Christmas holiday tradition supporting children from homeless families. 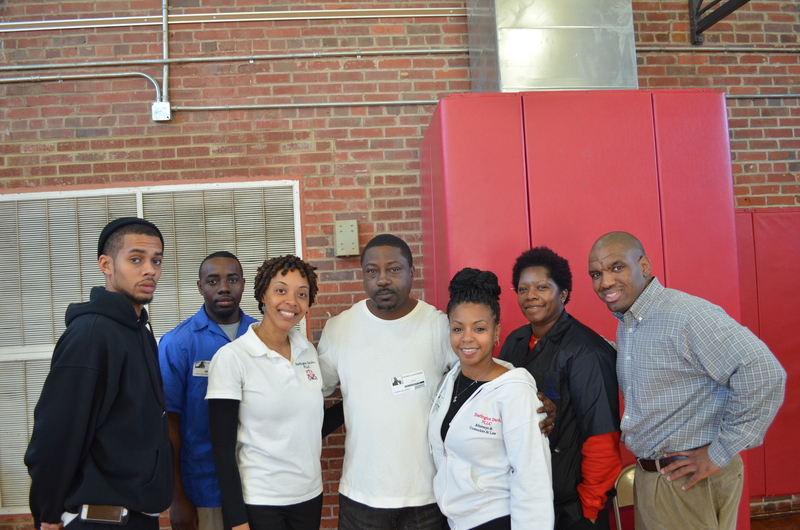 Giving Back, organized and spearheaded by magazine publisher and small businessman Rashad Phillips launched the initial effort at Thomasboro Academy on Monday, just before the school shuts down for the holidays. Thomasboro Academy is a K-8 school on Charlotte’s Westside. Of the nearly 800 students enrolled, more than 100 homeless families are represented. More than 90 percent of students are on free-and reduced-lunch program, an indicator of poverty. “While there are official CMS programs, government agencies, a church and some marginal community support for the school and target students, they are not nearly adequate,” says Phillips, publisher of New Growth Hair magazine. “So, my colleagues and business associates pooled our energies and resources to what we felt was a must-do heading into these next couple of weeks that children will be out of school,” he explains. Giving Back included a collection of local barbers and barber school students who volunteered two hours giving boys free haircuts for the holiday. For some, barbers believed these to be some boys’ first cuts since the school year started, and for others surely their first in at least a month. In addition to the free haircuts, Giving Back secured enough food to send more than 200 bags of non-perishable food items home with the boys and other students. 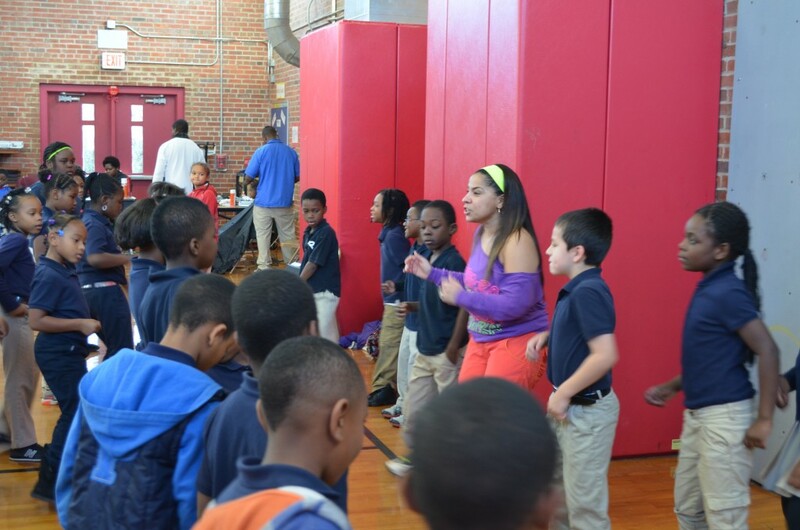 The children were also treated to a special Zumba dance session that proved to be both exhausting and fun. “For many of these students, their breakfast and lunch here at Thomasboro are their first and usually only true meal they have every weekday. And with school being closed for the holidays, imagine the impact on their daily nutrition and ability to have a meal on those days out of school,” laments Phillips. Giving Back is not a one-man operation. Phillips is joined and supported by several business associates and barbers, whose shops serve as primary outlets for his magazine’s distribution. Some of them are native Charlotteans while others have moved here recently. Karen Darlington and Salena Davis are principals of Darlington & Davis Law Firm. Tina Knox overcame single-parenting as a teen mother to become a successful business owner of Spend Smart Now, a budget and debt management company. 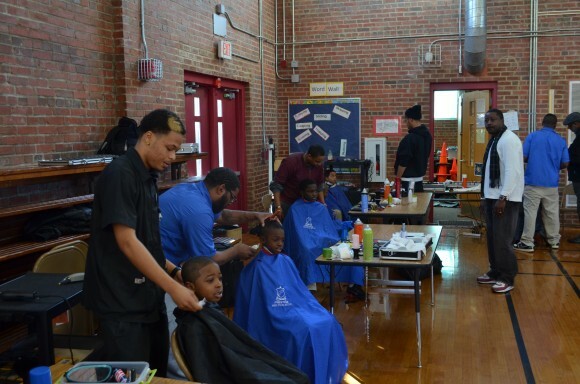 Patrick Anderson, owner of Prestige Barber Institute, brought his students to teach them the need and importance of giving back to less fortunate. Other barbers came on their own, like Henry Carter of Edwards Barber Shop and In The Cut Barber Shop’s La Meek, who moved here two years ago. A newcomer from New Jersey two years ago, Dawn Owens is a Zumba instructor who has become a local celebrity known as “I.B. Zumba.” She worked the co-ed enrollment with morning classes. Phillips promises to be back not just next year for the holiday, but throughout the year.